The Shakun Debacle - Temperature or CO2 Leads? Numerous studies of ice core data confirm that over the last four ice ages temperature changes precede CO2 changes. But a recent paper titled "Global warming preceded by increasing carbon dioxide concentrations during the last deglaciation" by Shakun et al, published in the journal Nature, April 2012 (Shakun2012), purports to show the opposite, that CO2 changes preceded temperature change. Point 3 at the top of the FoS home page, "Al Gore was wrong about CO2" presents a graph demonstrating that first temperatures rise, then CO2 rise. A detailed analysis by Cailion et al (2003) of air bubbles trapped in Antarctica ice cores finds that the CO2 increase lagged Antarctic deglacial warming by 800 +or- 200 years as described in our Climate Change Science essay here. The authors measured the isotopic composition of argon40 and CO2 concentration in air bubbles in the Vostok core during the end of the third most recent ice age (Termination III), 240,000 years before the present. The argon40 isotope is found to be an excellent proxy for temperature. The temperature is determined from the air bubble, not the surrounding ice, so there can be no time lag between these measurements. The Shakun2012 paper requires close scrutiny since it reports the opposite conclusion of many other studies. The paper here, calculates an area weighted mean of 80 globally distributed proxy temperature records to determine a global average temperature history. This temperature history is compared to the CO2 record determined from Antarctica ice cores. The authors report that temperatures in Antarctica increases first, followed by increasing CO2, and followed by the global average temperature. They claim the global average temperature rise being after the CO2 rise is consistent with CO2 causing the deglaciation. Fig 2a of the paper below shows the Antarctic temperatures rising in red, followed by the CO2 in yellow, followed by the global average temperature in blue. Fig 5b below shows the proxy temperatures in 30 degree latitude bands expressed as fractions of the glacial to inter-glacial (G-IG) temperature range. The graph shows the temperature in the tropics and the southern hemisphere increasing well before the CO2 increasing. The data as presented does not suggest that rising CO2 caused the rise in northern hemisphere temperatures. Since factors other than CO2 must have caused the rise in tropical and southern exotropic temperatures, these factors likely also caused the rise in northern exotropic temperatures. The authors suggest that small changes in the Earth's orbit resulted in more sunlight in the northern exotropics. Temperatures north of 60 degrees latitude increased by about 12 percent of the G-IG range of 3.5 Celsius to 19 thousand years (kyr) ago. The temperature rise in Greenland of about 4 Celsius caused fresh melt water to reduce the Altantic Meridional Overturning Circulation (AMOC). They suggest that the reduced AMOC caused cooling of the northern hemisphere to about 17 kyr ago and warming of the southern hemisphere. The southern hemisphere warming caused CO2 out-gassing from the Southern Ocean. Finally, the northern hemisphere resumed warming from about 17 kyr ago, and the authors suggest this warming was caused by the CO2 increase that was out-gassed from the Southern Ocean. This chain of events is not supported by the data presented in the paper. The author just assumed that warming in the north to 19 kyr ago would reduce the AMOC, and that the AMOC is the only mechanism that could have caused southern hemisphere warming. They ignore the Pacific ocean and ENSO processes. If the Southern ocean warming was not caused by CO2, it seems highly unlikely that the northern hemisphere warming after 17 kyr ago was caused primarily by CO2. There remains a possibility that rising CO2 could have provided a small positive feedback to the natural warming during deglaciation, but this paper provides no evidence of that. Willis Eschenbach has published a series of posts on the popular website WattsUpWithThat.com which examines the proxy temperature data and the paper's conclusions. Temperature proxies do not respond only to temperature and so can be misleading as anyone who has followed the Climategate "hide the decline" controversy knows. The first post here plotted each of the 80 temperature proxies used in the paper. Willis noticed that "The peaks for the previous interglacial period (the Eemian, about 130,000 BC) don’t line up." indicating that there may be a dating problem in the proxies. There is an incredible variation in shape and timing of the alleged warming among the proxies. 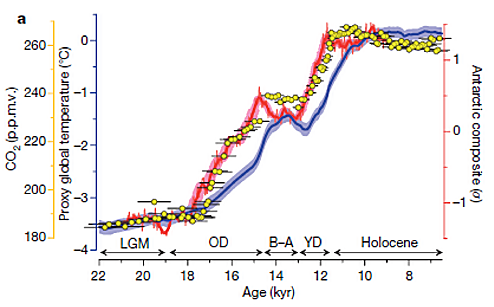 Some start warming at 25,000 BC, others at 15,000 BC. He writes "Sometimes the warming peaks as early as 14,000 BC, and sometimes around 5,000 BC or later." 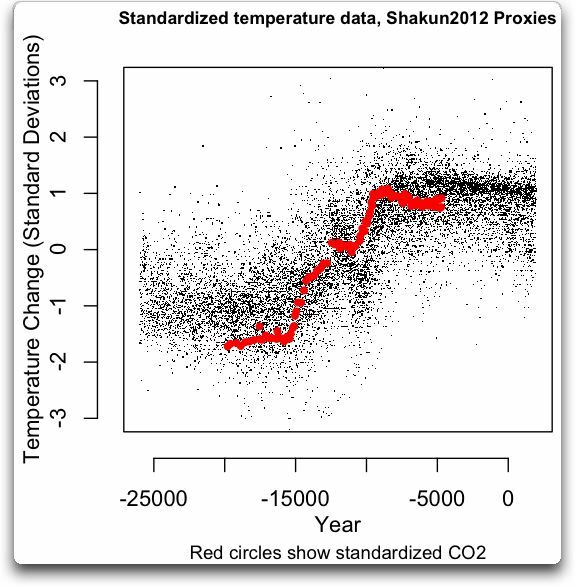 He plotted here all the temperature proxy data (black dots) along with the Antarctica CO2 data (red circles). Willis concludes "How on earth could you claim anything about the timing of the warming from this group of proxies? It’s all over the map." 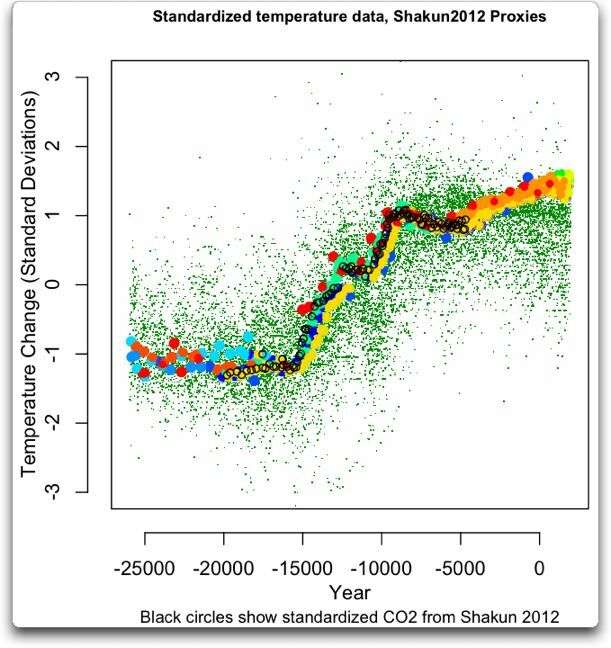 Willis' second post here presents a graph of the temperature proxies (green dots) with the Antarctica CO2 used in the paper (black circles) and several other ice core CO2 records (coloured circles) below. The CO2 records show that CO2 started to increase from 6000 BC while temperatures were slowly declining. Willis writes "Look how they have cut the modern end of the ice core CO2 record short, right at the time when CO2 started to rise again". Did the Shakun et al authors decided to hide the CO2 increase because the rising CO2 during eight millennium of the Holocene while temperatures were declining contradicts the premise that the CO2 rise drives temperature? Willis's third post here points our two more problems with the paper. The paper says "The data were projected onto a 5°x5° grid, linearly interpolated to 100-yr resolution and combined as area-weighted averages." Since there were only 80 proxies, most of the grid cells with data contains only one proxy, so area weighting by grid cell area would give too little weight to a proxy near the poles and too much weighting to proxies in the tropics. The grid cell size has nothing to do with the area represented by the proxy, so the area weighting by grid cell area makes no sense. The second problem is that the two Greenland temperature proxies show warming of 27 and 33 deg Celsius, while the rest of the proxies average temperature rise is only 4 deg Celsius. These appear to be wild outliners and should have been removed from the study. Willis' fourth post here reviews the proxy data presented in Fig. 5a which shows temperature trends prior to the start of the CO2 increase at 17.5 kyr ago. Fig. 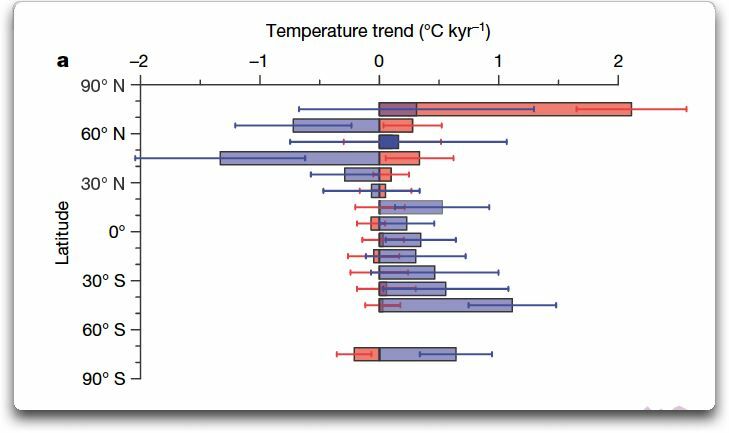 5a here shows the trends of the proxy data from 21.5 to 19 kyr ago (red bars) and the trends from 19 to 17.5 kyr ago (blue bars) averaged in 10 degree latitude bands. The thin lines show the one sigma uncertainties. Willis incorrectly writes that the figure "purports to show that the further north, the later the warming." In fact the graph shows that the north region warmed first (the red bars) when there was no warming in the tropics and the southern exotropics. Later, the south warmed while the north cooled as shown by the blue bars. This is consistent with the authors proposed chain of events as presented in the paper. The northern hemisphere then warmed from about 17 kyr ago, after the start of the rise in CO2 levels, and after the rise of southern temperatures. Fig. 5.a does not show this delayed warming from 17 kyr ago. Fig 5a purports to show that the Northern exotropics warmed before the tropics and southern exotropics, and that the northern exotropic cooled from 19 kyr ago to 17.5 kyr ago before warming again. In 9 of the 14 bands, the uncertainties overlap, so the data doesn't indicate that the trends are different. Usually, 2 sigma uncertainties are required to show significant differences. There are far too few proxies and their trends are so different it is impossible to say if the northern exotropic warmed before the rest of the planet. The data presented in the paper does not support the conclusions. The paper suggests that the initial northern warming at 21.5 kyr ago was "rising boreal summer insolation" due to orbital changes, that is, the Sun. The alleged evidence that the northern hemisphere temperature rise after 17 kyr ago occurred after the rise in CO2 does not mean that the temperature rise was caused by CO2. On the contrary, the fact that the initial northern temperature rise was solar-caused and the southern hemisphere temperature rise was caused by factors other than CO2 (possibly by the AMOC slowing) strongly suggests that the northern hemisphere temperature rise from 17 kyr ago was also caused by factors other than CO2. A correlation between northern temperatures and CO2 after 17 kyr ago does not imply causation. Water vapour is the most important greenhouse gas. A 2.8 % increase in water vapour has the same effect on out-going radiation as a 100 % increase in CO2. Water vapour humidity at 8 km altitude declined 13 % (best fit) from 1960 to 2011, see here, largely offsetting the warming effect from CO2. This likely also happened at the end of the last ice age. Sakun et al did not provide radiosonde measurements to the contrary.